What's better than a headcover under your arm? - Avid Golf, Inc. | Avid Golf, Inc.
What’s better than a headcover under your arm? Article written in PGA by John Holmes. One of the things about golf that amazes me the most is the sheer creativity of the people who love it. Specifically, I love the millions of training aids out there – some are so complex it seems like it took rocket scientists to develop them, while others are as simple as first-grade math. A few years ago, Dana Clark was taking lessons to battle her chicken wing, but felt a little ridiculous making swings with a headcover tucked under her arm. She wondered why no one had developed a training aid that would work better, so she set out to create one herself — and, two years later, she’s come out with the Swedge. 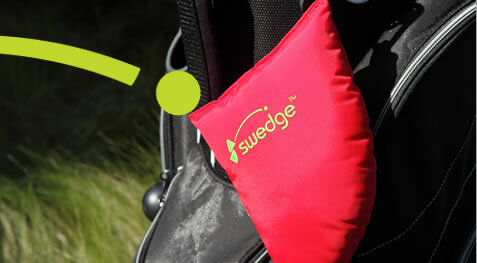 The Swedge is a small, washable half-moon pillow covered with a durable nylon casing. It comes in black, red and blue and has a convenient clip that attaches right to your golf bag. Its goal, of course, is to help keep your back elbow – (the right elbow for right-handed players) – tucked in closer to your body throughout your swing to prevent your elbow from flying away and to help you keep your swing tight and compact. 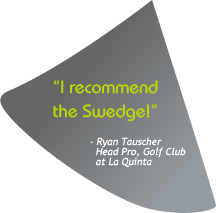 The Swedge was introduced at the ING Spring Conference, where it won the “Best Product” Award, and was on display during the recent PGA Expo in Las Vegas. Made in America, it retails for $29.99 and is available at Golfsmith and at avidgolfusa.com.